Designed for off-road applications while providing long, even wear in highway applications. Maximizes traction in soft surfaces. Provides excellent performance during all seasons, on or off-road. 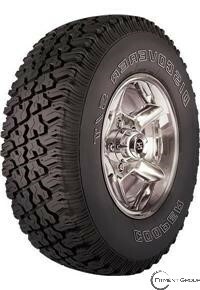 Distributes contact evenly across the tread for balanced wear. Fights irregular wear and improves self-cleaning capabilities. Breaks up harmonic pitch, significantly reducing tire noise. Available in light truck and flotation sizes. Self-cleaning tread features holes for metal traction studs.